As is becoming traditional we kicked off the UK based meetings in the Spring at Cumberwell Park which is a great course and always in good condition. Many thanks to John Ledgister for organising this meeting. A week later we played the SCLI/1LI Golf Society at Cannington Golf Course, just outside Bridgewater, Somerset. A closely fought match with the Farmers Boys winning by 29 points to 27. Ron Cooke was the overall winner with Dave Gardner coming second. A new fixture on 10 May 2018 saw John Marsh, Arthur Christian, Tony and Kev Flay represent the Farmers Boys at an ABF competition at Bristol and Clifton Golf Club. This was a wonderful event on a really top class course and we were delighted to come 3rd(on countback) out of 20 teams who entered. We were pipped at the post by 1 RIFLES who came 2ndand we were only 2 pts behind the winners, 22 Engineer Regiment. This event is now firmly in our annual calendar and it would be good to try to enter 2 teams in 2019. This was a good warm-up for the annual Burma Cup against the Slashers which took place at Cumberwell Park. It was our turn to host and again many thanks to John Ledgister for organising the event and captaining the team. Unfortunately, despite some very good performances we were unable to repeat our victory when we last played the Burma Cup at Cumberwell, but it was a very enjoyable day. • 1st- The Gilson Trophy – Dave Gardner. As Champion Golfer, Dave received the Regimental Plate. This was presented by Kev Flay, the 2017 Champion Golfer, who also kindly donated a bottle of vintage port. From 2019 the Committee has agreed that the Champion Golfer will be presented to the golfer with the best Medal Nett score. • 2nd- The Bone Beaker – Steve McIntyre. •1st- The Gilson Bowl – Les Buchanan. •2nd- The Gamble Cup – Smudger Smith. •1st(18 handicap and below) – The James Cup – Andy Fontana. •2nd(18 handicap and below) – The Shorncliffe Cup – Bob Luckwell. •3rd(18 handicap and below) – Kevin Flay. o 1st(19 handicap and above) –The Education Cup – Mick Godwin. o2nd(19 handicap and above) – John Marsh. o3rd(19 handicap and above) – Toby North. •Best Guest Score – Mick Fisher. •Nearest the Pin in 2 (7th) – Tony Flay. •Nearest the Pin (12th) – Andy Fontana. •Most Golf Played – The “Frog” Trophy – Farren Drury. •And the “Bandit” trophy, nominated and awarded by the previous year’s winner (Smudger Smith), was presented to Les Buchanan for scoring 42 points with a 27 handicap. We again supported the Devon ABF charity golf day at Dainton Park Golf Course on 20 June 2018 and a band of Farmers Boys attended another great day of golf on 3 August 2018 at Brickhampton Golf Course for the annual Slashers golf meeting. 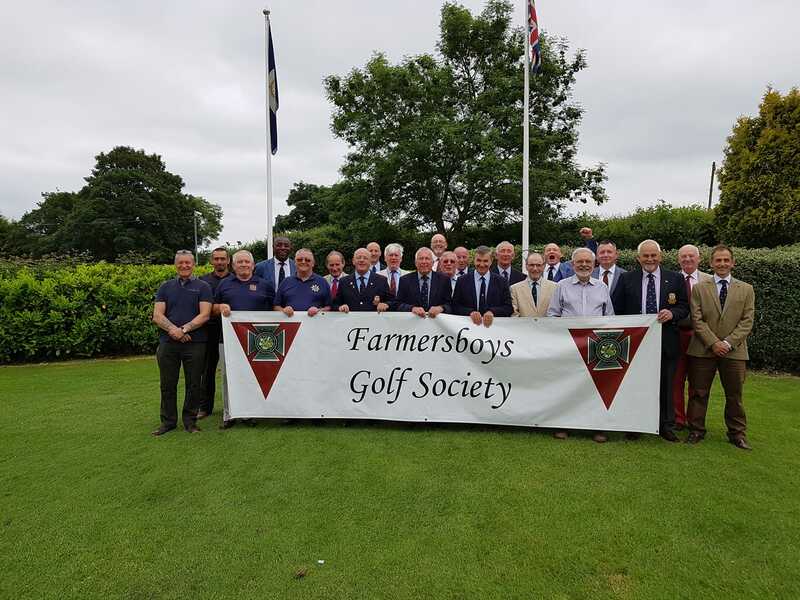 Arthur Christian led a team of Farmers Boys to the Mercian Regiment charity golf day at Rufford Park Golf Course in Nottinghamshire on 31 August 2018 which was a huge success. Many thanks to Steve McIntyre for organising our autumn meeting which took place at Chipping Sodbury on 21 September 2018. We combined this meeting with a return match against the SCLI/1LI Golf Society and we managed to maintain our unbeaten run. Finally, as is now traditional our last meeting of the season was the Rifles Regimental Golf Day on 8 October 2018. Many thanks again to Steve McIntyre for captaining our team. Respectable performances but we unfortunately were unable to repeat the success of 2015 and win back the trophy. •12 – 15 March 2019 – Tour to Spain (Islantilla golf resort). Already planned and fully booked. For info. •27 April 2019 – The SCLI/1LI Golf Society meeting at the Cannington Golf Centre, Bridgwater. •3 May 2019 – The Spring meeting at Cumberwell Park Golf Club, organised by John Ledgister. This will also include a “fun team warm-up” on the par 3 course and I have invited the SCLI/ILI Golf Society to join us. •9 May 2019 – The Bristol ABF Charity Day at Bristol and Clifton Golf Club. We entered a 4-ball team this year and came 3rd. It is a great course and an excellent event and it would be good if we could enter 2 teams in 2019. •7 - 10 June 2019 – The DERR@60 weekend at Hayling Island. No society organised summer golf meeting in 2019 but there is nothing to stop members who are attending the DERR@60 weekend organising an ad hoc round amongst themselves if they wish. •19 June 2019 – The Devon ABF Charity Day at Dainton Park GC being organised by Trevor Ongley. •12 July 2019 – The Burma Cup. The Slashers turn to host this year and it will be held at Brickhampton Golf Club. We will be captained by John Ledgister. •9 August 2019 – The Slashers Annual Meeting at Brickhampton GC. •23 August 2019 – The Mercian Regiment Charity Day at Rufford Park GC, Nottinghamshire. Arthur Christian will act as the Farmers Boys administrative coordinator. •15/16 September 2019 – The Autumn Meeting - an overnight 2 round lunch, dinner, B&B package at Bowood GC to celebrate the 60thanniversary of the formation of the Regiment. The admin instr has already been sent out and the deposit paid by those attending (16 so far). If you would like to attend but were unable to commit this far out please make a note of the dates as I will see if there is any availability for additional places early in the New Year. •14 October 2019 – The Rifles Regimental Golf Meeting at South Winchester GC.